Alex, Daniele and Ali were to attempt Nanga Parbat in winter again from camp 4 7200, but they took the difficult decision to abort attempt and come down to base camp. Alex announced news on the evening to March 13th. It turns out that reason of abort by severe altitude sickness faced by Muhammad Ali Sadpara. The first communication took place today (March 14) at 7:30 in the morning, when Alex informed base that they will start descend in one and half hour. They were waiting for clouds to scatter and sun to come out. The second contact was made at 8 a.m. requiring about weather conditions. The third contact was made at 8:30 a.m. when Alex informed base that Ali is not properly vocalizing, he is speaking nonsense and and his body does not seem to coordinate. These are signs of altitude sickness, Alex sounded worry and he said we need to bring down Ali. It was decided on the call that Muhammad Khan will carry some food, medicines and meet them in camp 2 at 6100 meter. Muhammad Khan left immediately for camp 2 with food, medicine and one tent. Alex and Daniele carried what they could in their rucksacks and started descend to camp 3 with Ali. There were many sections on the route from camp 3 6700m to camp 4 7200m, which were not equipped with rope by climbers when they were ascending to camp 4. It was was challenging to come down to camp 3, when some sections were not equipped with fixed rope. Ali was clumsy and slipping over and over again, Alex had to be beside him and help him descend. Climbers felt better when they reached camp 3, since rope was fixed all the way from camp 3 6700m to camp 1 5100m. Although ropes were fixed, but high level of concentration was required to deal with blue ice pitches and sections of mixed climbing. Section between Camp 4 and Camp 3 was partly equipped with rope. The sections below camp 3 involve pitches of blue ice and mix climbing. The next contact was made on 2 p.m. when Alex informed base that they have reached camp 2 6100m. Ali also talked to Muhammad Khan who was on the way to camp 2 that time with food and medicines. Ali started crying on call, which made Alex and Daniele feel good, because Ali was getting aware of the serious situation they are in. Alex and Daniele spoke about their attempt on Nanga Parbat, they let Ali lead the way from camp 4 to summit because Ali knows the terrain well, since he has already climbed Nanga twice in summer. 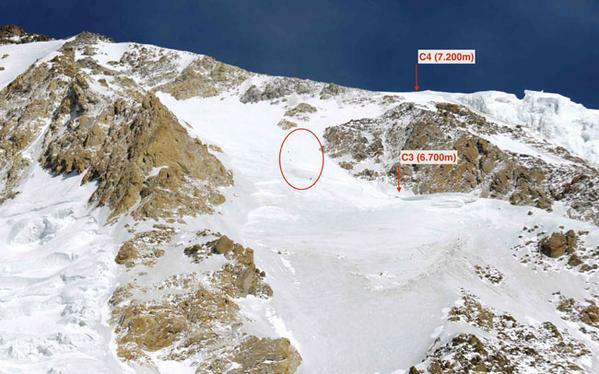 According to climbers, Ali was bit clumsy when they were ascending to top, and suddenly he said we are on wrong side of route and there is no option except to descend down to camp 4. Alex and Daniele could not think it through, fatigue had taken over all climbers and they all descended down to camp 4. This was the first sign of altitude sickness according to Alex and Daniele. Alex spoke about the controversy, whether they reached 8000m or not. According to Alex, they did not compared the altitude with altimeter, they just gave a number to base camp in excitement. They don’t want to talk much about it yet, but they will have a look at pictures and know where exactly they reached. 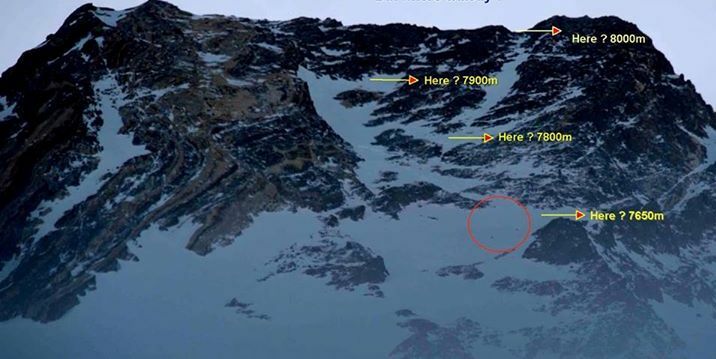 According to Pello, who took pictures from base camp, pictures does not show the point reached by climbers, climbers might have gone higher than that point. They did not reached the ridge, which means they did not reached 8000 meter. The point reached could be around 7700 meter according to best estimate. Altitudes of various final sections of Nanga Parbat. Ali is feeling slightly better now, he still had bad headache and some signs of sickness, they all hope he get better soon. Why not be gone down before, spending one night to camp 3?